A woman suffered serious but not life threatening injuries in a crash on Fletton Parkway in Peterborough. The collision, involving a mini and a Fiat 500 took place on the westbound carriageway close to the Orton junction at around 5pm last night. Ambulance crews attended and conveyed a woman, the driver of the Mini to Peterborough City Hospital with serious but not life threatening injuries. There were long delays back past the Hampton roundabout. 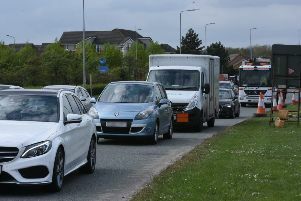 The A15 through Yaxley was also brought to a standstill as motorists tried to divert around the collision. The road was cleared and fully reopned at 6.48pm.